Abstract: Sliding Mode Control is a nonlinear control methodology based on the use of a discontinuous control input which forces the controlled system to switch from one structure to another, evolving as a variable structure system. This structure variation makes the system state reach in a finite time a pre-specified subspace of the system state space where the desired dynamical properties are assigned to the controlled system. In the past years, an extensive literature has been devoted to the developments of Sliding Mode Control theory. This kind of methodology offers a number of benefits, the major of which is its robustness versus a significant class of uncertainties and disturbances during the sliding mode. Yet, it presents a crucial drawback, the so-called chattering, which may disrupt or damage the actuators and induce unacceptable vibrations throughout the controlled system. This limits the practical applicability of the methodology, especially in case of mechanical or electromechanical plants. This drawback has been faced by recent theoretical developments, oriented to increase the order of the sliding mode, thus producing efficient Second Order and Higher Order Sliding Mode Control algorithms. Robustness of the controlled system, in addition, has been extended to hold since the initial time instant of the control horizon, via the so-called Integral Sliding Mode Control approach. These “modern” results can be profitably used to efficiently solve automotive control problems, as testified by several recent publications and research projects. The aim of this lecture is to provide an outline of the mentioned theoretical advancements, and an overview of available examples of application of sliding mode control to the automotive field, focusing on recent activities developed by the research group chaired by Prof. Ferrara at the University of Pavia. Biography: Antonella Ferrara received the Laurea Degree in Electronic Engineering in 1987 and the Ph.D. degree in 1992, both from the University of Genova, Italy. Since January 2005 she is Full Professor of Automatic Control in the Department of Electrical, Computer and Biomedical Engineering (ECBE) of the University of Pavia, Italy. Her research activities are mainly in the area of sliding mode control, with application to automotive control, traffic control, power plants control and robotics. She was and is scientific leader of research teams in national and international research projects. She authored or co-authored more than 300 papers, one third of which are international journal papers. She was Associate Editor of the IEEE Transactions on Control Systems Technology and of the IEEE Transactions on Automatic Control. Since January 2014, she is Associate Editor of the IEEE Control Systems Magazine. She currently is and has been member of the International Program Committee of numerous international conferences and events, as well as Program Chair and Vice-Chair. She is Senior Member of the IEEE Control Systems Society, member of the IEEE Technical Committee on Variable Structure and Sliding Mode Control, of the IEEE Technical Committee on Automotive Control, of the IFAC Technical Committee on Transportation Systems, among others. She was appointed member of the Board of Governors (BOG) of the IEEE Control Systems Society in 2012 and is elected member of the BOG for the triennium 2016-2018. She is one of the members of the Council of the European Control Association (EUCA). She was Chair of the IEEE CSS Women in Control Standing Committee since July 2013 to December 2016. ATSUO TAKANISHI is the Department Head and a Professor of the Department of Modern Mechanical Engineering as well as the director of the Humanoid Robotics Institute, Waseda University. He received the B.S.E. degree in 1980, the M.S.E. degree in 1982 and the Ph.D. degree in 1988, all in Mechanical Engineering from Waseda University. 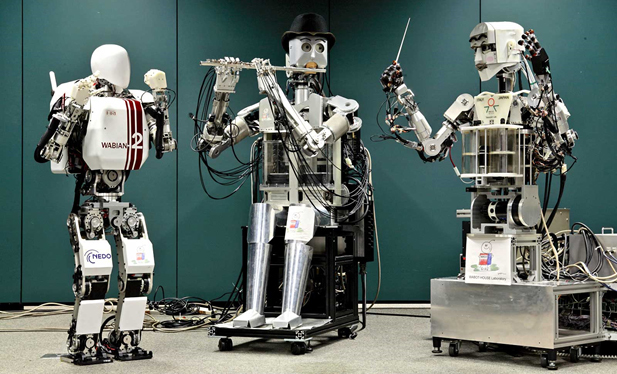 His current researches are related to Humanoid Robotics and its applications in medicine and well-being, such as the biped walking/running humanoids, the emotion expression humanoids, the flute player humanoids, the ultrasound medical inspection robots, the airway management training humanoids, etc. He recently initiated new projects on disaster response four legged robots and mobile robots for animal monitoring. He was the President of the Robotics Society of Japan from 2015 to March in 2017. Abstract: Interest has increased in recent years in the design of advanced manufacturing systems, towards making major advances in product quality and productivity. Some specific advanced manufacturing systems are used to illustrate their control-relevant characteristics, which include (1) high to infinite state dimension, (2) parameter uncertainties, (3) time delays, (4) unstable zero dynamics, (5) actuator, state, and output constraints, (6) stochastic noise and disturbances, and (7) phenomena described by combinations of algebraic, ordinary differential, partial differential, and integral equations (that is, generalizations of descriptor/singular systems). Progress is discussed in the development of systems and control methods to address these challenges, which include hierarchical “plantwide” control coupled with sensitivity and probabilistic uncertainty analyses for hybrid systems; “plug-and-play” technology for accelerating the design and implementation of automation, systems, and control solutions; and advanced robust model predictive control formulations. Both experimental and realistic simulation results are presented for advanced manufacturing facilities developed, constructed, and thoroughly validated at the Massachusetts Institute of Technology. Biography: Richard D. Braatz is the Edwin R. Gilliland Professor at the Massachusetts Institute of Technology (MIT) where he does research in control theory and its application to advanced manufacturing systems. He received an MS and PhD from the California Institute of Technology and was the Millennium Chair and Professor at the University of Illinois at Urbana-Champaign and a Visiting Scholar at Harvard University before moving to MIT. He has consulted or collaborated with more than 25 companies including IBM, United Technologies Corporation, and Novartis Laboratories, and leads the automation, systems, and control activities of multiple advanced manufacturing research programs at MIT. He currently serves the systems and control community as the Vice President of the American Automatic Control Council and on many editorial boards, and he was the Editor-in-Chief of IEEE Control Systems Magazine from 2012 to 2014. He is a recipient of the Donald P. Eckman Award from the American Automatic Control Council, the Antonio Ruberti Young Researcher Prize, the IEEE Control Systems Society Transition to Practice Award, and the Excellence in Technical Innovation Award from the International Society of Automation. He is a Fellow of the Institute of Electrical and Electronics Engineers and the International Federation of Automatic Control. On-Chip Atomic Force Microscope: Why and How? Abstract: The Atomic Force Microscope (AFM) is a complex mechatronic system and a powerful tool for high-resolution imaging and manipulation of matter with sub-nanometre precision. The high resolution and versatility of the AFM has made it a vital tool for imaging and characterizing material surfaces in a variety of fields such as biology, chemistry, materials science, nanotechnology and the electronics industry. However, the AFM suffers from inherent limitations in imaging speed. It typically takes more than 30 seconds for a commercial AFM to produce a single image. Consequently, there is significant push to develop high speed AFMs. In this talk, we review recent progress in high-speed atomic force microscopy, emphasizing the latest efforts to develop a MEMS-based high-speed on-chip atomic force microscope. Dr. Moheimani is a Fellow of IEEE, IFAC and the Institute of Physics, U.K. His research has been recognized with a number of awards, including IFAC Nathaniel B. Nichols Medal (2014), IFAC Mechatronic Systems Award (2013), IEEE Control Systems Technology Award (2009), IEEE Transactions on Control Systems Technology Outstanding Paper Award (2007) and several best paper awards in various conferences. He is Editor-in-Chief of Mechatronics and has served on the editorial boards of a number of other journals, including IEEE Transactions on Mechatronics, IEEE Transactions on Control Systems Technology, and Control Engineering Practice. He currently chairs the IFAC Technical Committee on Mechatronic Systems. Biography: Reza Moheimani currently holds the James Von Ehr Distinguished Chair in Science and Technology in Department of Mechanical Engineering at the University of Texas at Dallas. His current research interests include ultrahigh-precision mechatronic systems, with particular emphasis on dynamics and control at the nanometer scale, including applications of control and estimation in nanopositioning systems for high-speed scanning probe microscopy and nanomanufacturing, modeling and control of microcantilever-based devices, control of microactuators in microelectromechanical systems, and design, modeling and control of micromachined nanopositioners for on-chip scanning probe microscopy. Abstract: With rapid developments of information technology, network-based control has been widely used in industrial processes. However, various network-induced constraints such as transmission delays, packet dropouts/disorder and quantization, also bring great challenges to conventional control theories. On the other hand, in order to improve the efficiency and gain more profit, the two-layer network-based feedback control scheme has shown its great advantages over the traditional one-layer network-based one in operational control of industrial processes. This talk will first introduce some elegant approaches to network-based control and estimation problems. And then a novel two-layer network-based architecture for operational control of industrial processes will be discussed. It will be shown that under the proposed framework, the overall optimal operational control of networked industrial processes can be achieved. Biography: Huijun Gao received his Ph.D. degree in control science and engineering from Harbin Institute of Technology, China, in 2005. He was a Research Associate with the Department of Mechanical Engineering, The University of Hong Kong, from November 2003 to August 2004. From October 2005 to October 2007, he carried out his postdoctoral research with the Department of Electrical and Computer Engineering, University of Alberta, Canada. Since November 2004, he has been with Harbin Institute of Technology, where he is currently a Professor and Director of the Research Institute of Intelligent Control and Systems. Prof. Gao’s research interests include network-based control, robust control/filtering theory and their engineering applications. He is an IEEE Fellow and received the IES David Irwin Early Career Award. He is Co-Editor-in-Chief of IEEE Transactions on Industrial Electronics and Associate Editor of Automatica, IEEE Transactions on Control Systems Technology, IEEE Transactions on Cybernetics, IEEE/ASME Transactions on Mechatronics etc. Prof. Gao is an IEEE Industrial Electronics Society (IES) Administration Committee (AdCom) member. He is a Thomson Reuters Highly Cited Researcher and was listed among the top 17 scholars in “The World’s Most Influential Scientific Minds” by Thomson Reuters, 2014.